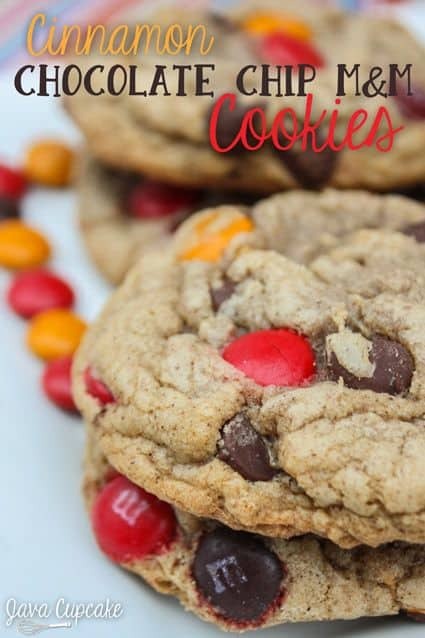 A twist on the traditional chocolate chip cookie, these Cinnamon Chocolate Chip M&M Cookies are full of flavor, chocolate and are sure to please everyone! If you’ve been reading Java Cupcake for a while, you may know I kind of have an obsession with buying seasonal candy for baking. Yesterday, I may or may not have bought 10 bags of Christmas candy. Ya, I know. I may have a problem. Anyhoo… I realized last week that I had bought Fall themed M&Ms and have yet to use them. And with Thanksgiving just a few weeks away I figured I needed to jump on that train and make some cookies! Tonight, I’m Snack Mom for my daughter’s Girl Scout Troop. I asked Emily what the other moms had been bringing for snack and she told me they had deli sandwiches, fruit, chips and drinks. Woah. That’s a lot of “snack”. My idea of a snack is cookies or fruit or popcorn or granola bars. Something homemade, even. So yeah… these girls won’t be getting deli sandwiches. They’ll be getting cinnamon chocolate chip M&M cookies with milk. Lots of cookies. Lots of milk. I started with my Perfect Chocolate Chip Cookie recipe for these cookies. 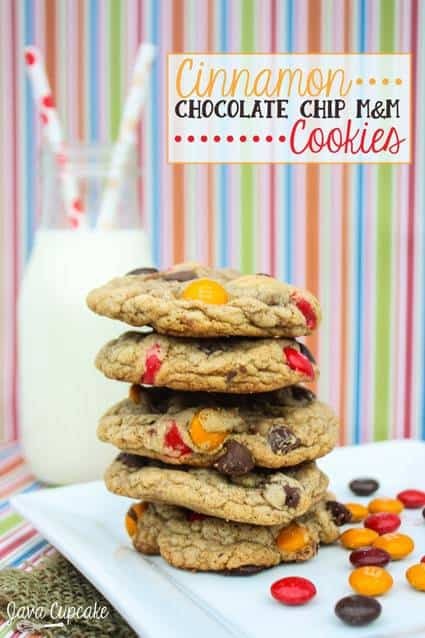 This recipe makes a cookie that’s crisp on the edges, chewy in the middle and has chunks of chocolate chips perfectly running through them. Yeah… they’re bomb. But, because it’s Fall… I wanted to add another layer of flavor to the cookies and decided to add cinnamon to the batter. YUM! Also, because I didn’t have all day for these cookies, instead of chilling them in the refrigerator, I popped them in the freezer for a couple hours the baked them. The butter int he dough just needed to bet set up enough so that the cookies didn’t run all over the pan when baking. 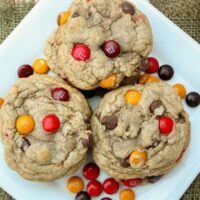 I place a couple extra M&Ms on top of each ball of dough, just to make them pretty and BAM… Cinnamon Chocolate Chip M&M Cookies! Perfect for Girl Scouts. Perfect for Fall. Perfect. In a large bowl, sift together the flour, cinnamon, baking soda, corn starch and salt. 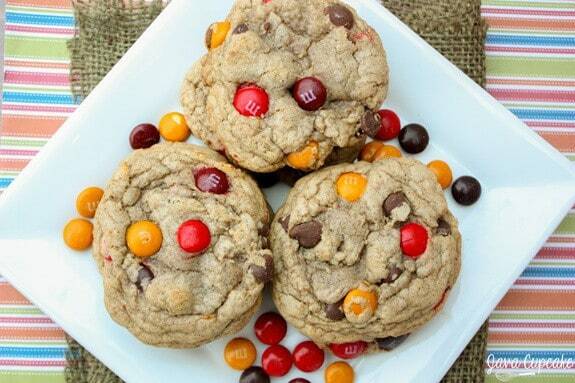 Reserve 1/3 cup M&Ms then add the remaining with the chocolate chips and fold together. Cover with plastic wrap and freeze for 2 hours. If you have time refrigerate for at least 8 hours or overnight. Roll 6 large balls of dough and place evenly on the prepared cookie sheet. Press 3-4 of the reserved M&Ms onto each ball. I always add extra cinnamon to everything so this recipe makes perfect sense – cinnamon and chocolate is a great pair! I know, right!! 🙂 And they were SO DELISH too!